Heart Sutra (Skt. prajñāpāramitā hṛdaya; Tib. ཤེས་རབ་ཀྱི་ཕ་རོལ་ཏུ་ཕྱིན་པའི་སྙིང་པོ་, Wyl. 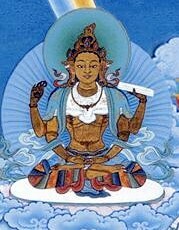 shes rab kyi pha rol tu phyin pa'i snying po), aka The Twenty-Five Verses on the Perfection of Wisdom — the most popular sutra of the prajñaparamita collection and indeed of the mahayana as a whole. Although the sutra primarily consists of a dialogue between Shariputra and the great bodhisattva Avalokiteshvara, their words are inspired by the blessings of the Buddha, who remains absorbed in samadhi meditation until the end of the discussion. As with all the prajñaparamita sutras, the teaching took place at Vulture's Peak near Rajagriha. It was first translated into Tibetan by Vimalamitra and Rinchen Dé. The translation was later revised by Gewé Lodrö, Namkha and others. In the various commentaries, there are different explanations as to how the sutra can be related to the five paths. The sutra includes the mantra tadyatha om gate gate paragate parasamgate bodhi svaha (tadyathā oṃ gate gate pāragate pārasaṃgate bodhi svāhā). Atisha explained that the mantra encapsulates the entire teaching of the Heart Sutra for the benefit of those of the sharpest faculties. The Heart Sutra is often recited together with a supplemental section for dokpa, the practice of averting harm and negativity. The text of the dokpa section refers to an incident recounted in the Perfection of Wisdom Sutra in Eight Thousand Lines and Perfection of Wisdom Sutra in Eighteen Thousand Lines, when the god Indra turned away Mara and his forces, who were approaching the Buddha, by contemplating and reciting the Prajnaparamita. Chögyam Trungpa, Cutting Through Spiritual Materialism, (Boulder & London: Shambhala, 1973) chapter 'Shunyata', pages 187-206. Dalai Lama, Essence of the Heart Sutra (Boston: Wisdom Publications, 2002), includes a commentary by Jamyang Gawé Lodrö (1429-1503). Garchen Rinpoche, Oral Commentaries on the Heart Sutra in Relation to Shamatha and Vipassana Meditation And Seven Point Mind Training, San Francisco 2001 (San Francisco, Ratna Shri Sangha). Eckel, Malcolm David, "Indian Commentaries on the Heart Sutra: The Politics of Interpretation" in Journal of the International Association of Buddhist Studies, vol. 10, no. 2 (1987), pp. 69-79. Silk, Jonathan. The Heart Sūtra in Tibetan: A Critical Edition of the Two Recensions Contained in the Kanjur, Arbeitskreis für Tibetische und Buddhistische Studien, Universitāt Wien (Vienna 1994). This page was last edited on 28 November 2017, at 09:55.